Town’s top scorer Danny Hylton should be fit to face Morecambe at Kenilworth Road on Saturday. 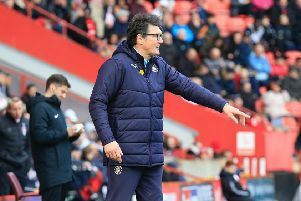 The 17-goal forward was absent from the Luton XI that were beaten 2-0 at Chesterfield last weekend due to a tight hamstring. He would be a big player for anyone, anyone outside the Premier League, I think, so it’s good to have him back. Boss Nathan Jones confirmed the striker is expected to be available, but was also quick to point out his side don’t rely solely on the former Oxford player to win games, saying: “He’s trained this week, so hopefully he will be fully fit and raring to go. “He would be a big player for anyone, anyone outside the Premier League, I think, so it’s good to have him back, but we’re more than a one man team. “It’s just when he doesn’t play and then we play as poor as we did last week, then that highlights the fact he’s not in the team. There was less good news regarding the injured trio of Luke Gambin, Alan McCormack and Scott Cuthbert though, as Jones added: “Gambin had a real bang, he’s outside doing some running but he just can’t have any contact or anything yet, so he’s not too far. “McCormack, I dont know, it’s just a slow progress with Macca. “Scotty saw a specialist last week so we can kick him on a little bit now.